Sorry to interrupt your day with what we consider not the best news. As new technologies shape and change our daily lives, it seems we are all still learning how to deal with it. Instagram has just shutdown most of their API limiting what third-party services can access. As a result, OnSign TV Instagram Apps will only get access to your own photos. Rules are still not clear as there is very little comments coming from Instagram. To avoid confusion, we will block the creation of new OnSign tv Instagram apps until we get more details about how things will actually work. We will keep you posted as we get more news about this topic. 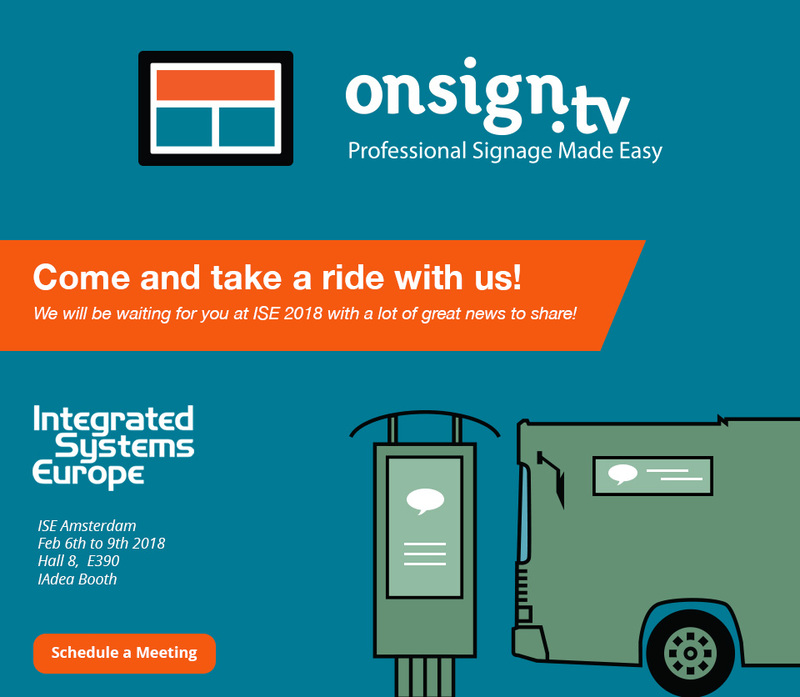 Sharp together with OnSign TV will be featuring two new Android powered SoC Screens (40" and 50") at the Digital Signage Expo 2018 in Las Vegas. This month we are releasing two great new apps with useful time-sensitive info that will for sure add a lot of value to you and your audience. Flight App: Ladies and gentlemen, prepare to take off! Provide latest arrivals and upcoming departures of any airport in the world! Time to Destination: Do you often wonder how bad is the traffic at rush hours? Get up-to-date travel time to multiple landmarks with the new "Time to destination" App! Tag-Filtered Reports: Create reports filtering which campaigns should be tracked based on tags! Likewise, you can filter players by tags. We are glad to announce that now OnSign TV is also compatible with BrightSign Media Players! Reporting tools are a core feature when you are managing advertisement on a large signage network. For this reason, our team has been working hard to always improve and automate the reporting process. Now you can add an extra layer of filtering on reports based on campaign and player tags. 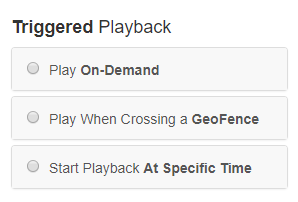 This feature gives you extra flexibility, as you don't have to remember, or restrict reporting to a given set of players or campaigns. Just to illustrate, you can create a tag called "Coca-Cola" and add this filter to your reports, so all past and future campaigns with this tag will be listed on your reports. 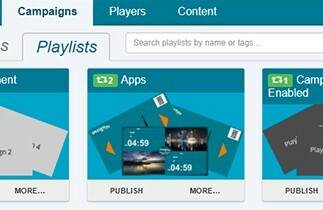 With more than a 1,000,000 players sold, BrightSign is well known player, recognized for its reliability and endurance. Now BrightSign is also a great option for running OnSign TV too! You can install OnSign TV on BrightSign LS3, XD3, XT3 and OPS series! Get to know more information about BrightSign, players supported and specifications. Take your time and track your flight while having breakfast at your hotel, or having lunch in at the restaurant nearby the airport. This app delivers up-to-date flight info to pretty much any airport in the world! Display latest arrivals and upcoming departures of any airport in the world. Setup the app for the closest airport! Whenever there is people on the move, there is a concern about how much time one will spend to get there. This is particularly true when it comes to large cities with heavy traffic. Keep viewers informed with estimate travel time to key city points. Estimates can be provided for traveling by car, bike and/or public transportation! Digital signage causes many impressions on viewers, but how one can keep track of interactions and get to know how beneficial signage is for business? In this article we will give some guidelines on how to calculate ROI, making sure you get all the relevant data regarding investments. On the other side, not only financial gains count when it comes to signage, but there are other goals that can be achieved. Read complete article. Get to known how digital out of home has been used past hurricanes Harvey and Irma hit Texas and Florida last month. Signage is often mentioned as a useful tool on emergency cases, but fortunately, rare are the cases in which we can use them for this purposes. Read complete article. 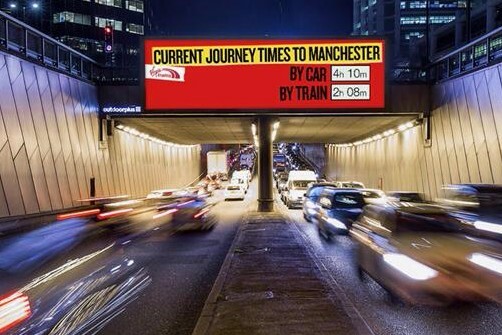 Virgin Trains combine traffic and distance data to highlight which transport option is more efficient during peak travel times.